Background: Some research studies have shown that Lippia pedunculosa essential oil (EOLP) has interesting biological activities. However, its low water solubility is the main challenge to achieve its therapeutic potential. In this context, Cyclodextrins (CDs) have been widely used in order to overcome this problem due to your capability to improve the physicochemical properties of drugs. Objective: In this perspective, the main goal of this study was to investigate how the improvement of the physicochemical properties of inclusion complexes (EOLP and β-CD) enhance the antinociceptive effect in mice. Methods: To achieve that, we prepared samples by Physical Mixture (PM), Paste Complexation (PC) and Slurry Complexation (SC) methods, followed by their physicochemical characterization. 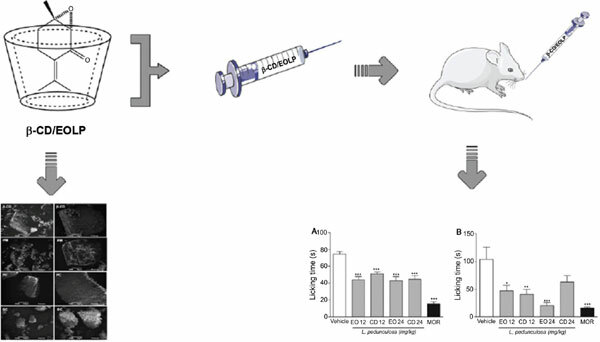 In addition, it was evaluated if the use of β-CD enhances the antinociceptive effect of EOLP in mice. Results: The analysis showed that rotundifolone (72.02%) was the major compound of EOLP and we found out based on DSC results that β-CD protected it from oxidation. In addition, TG techniques demonstrated that the best inclusion methods were PC and SC, due to their greater weight loss (10.8 and 11.6%, respectively) in the second stage (171-312°C), indicating that more complexed oil was released at the higher temperature than oil free. Other characteristics, such as changes in the typical crystalline form, and reduced particle size were observed by SEM and laser diffraction, respectively. The SC was the most effective complexation method, once the presence of rotundifolone was detected by FTIR. Based on that, SC method was used in all mice tests. In this regard, the number of paw licks was reduced for both compounds (all doses), but EOLP was more effective in reducing the nociceptive behavior. Conclusion: Therefore, CDs seem not to be a good tool to enhance the pharmacological properties of EOs rich in peroxide compounds such as rotundifolone. Keywords: β-cyclodextrin, Essential oil, Lippia pedunculosa, Rotundifolone, D-limonene, Pain. Keywords:β-cyclodextrin, Essential oil, Lippia pedunculosa, Rotundifolone, D-limonene, Pain. Abstract:Background: Some research studies have shown that Lippia pedunculosa essential oil (EOLP) has interesting biological activities. However, its low water solubility is the main challenge to achieve its therapeutic potential. In this context, Cyclodextrins (CDs) have been widely used in order to overcome this problem due to your capability to improve the physicochemical properties of drugs.